It depends upon the material, it depends on the pitch, it depends on the aspect of the roof, and it depends on the workmanship. Generally water reed is thought to last the longest around 25 – 40 years, Combed Wheat Reed 25-35 and Longstraw 15-25, there are always exceptions. Ridges 10-15 years. Will a roof require any maintenance? Yes, a new ridge will need to be applied every 10 – 15 years and at this time the whole roof can be dressed and cleaned and any moss removed. Why do some roofs have wire netting on them? 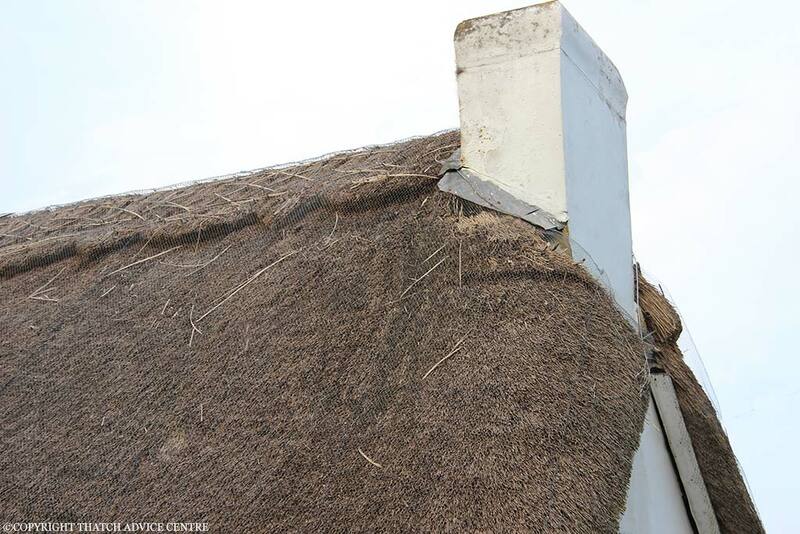 a) With new roofs it is to protect straw roofs from birds, it is also fitted to ridges for the same reason. b) On older roofs it adds protection from strong winds etc, especially in exposed areas. How much will it cost to employ a thatcher to work on my roof? Thatch is usually priced by area or by “thatchers square.” 1 thatched square = 100 square feet. Patching work is usually priced by how long the work will take and the materials required, overheads, etc. Ridging work is usually priced by the linear foot or meter. Included below is a checklist for receiving and comparing quotes from thatchers. Compare items like for like within the quote (i.e. is my ridge work going to have the same cut, pattern or depth. Does the quote include scaffolding, the disposal of waste, travel and accommodation, flashings and wiring? How long will the thatcher be on site? – A one man band may be on your roof for 6 months, whereas a larger team may do the work in four weeks for a similar price. Are they insured? Public Liability and Employers? Prices vary across the country. This is unfortunate but if price is your main consideration thatchers from outside your area may be an option. How can I tell if my roof needs maintenance? Thatch unlike most other roofing materials is usually more evident when it is nearing the end of its useful life or needs maintenance, look out for fixings starting to show e.g. horizontal lines across roof or spars sticking up (when newly thatched, fixings should have a covering of approximately 6”). The coat work should have a nice even look, if gullies or dips are forming it would be as well to call your thatcher to have a look for you. Dark wet patches under the eaves show how much water penetration there is, if they start forming as a ‘V’ to the wall plate, then this should be checked. Thatch roofs need to shed the water as quickly as possible so valleys which have a larger volume of water will generally not last as long as the flatter steeper coat work, also moss and lichen can slow the progress of the rain water down and speed up deterioration. A roof which looks a bit worn may still do its job. Send us a picture if you are worried. In the UK new water reed or straw is generally 12″ – 15″ thick. (300 – 450mm). On a re-coat e.g. going over existing basecoat 10-12 equals new thatch. This is why some thatch is very thick. Why are some roofs a lot thicker than others? With straw roofs layers are added to existing layers (re-coating,) sometimes these roofs can be 3 or 4 thick. 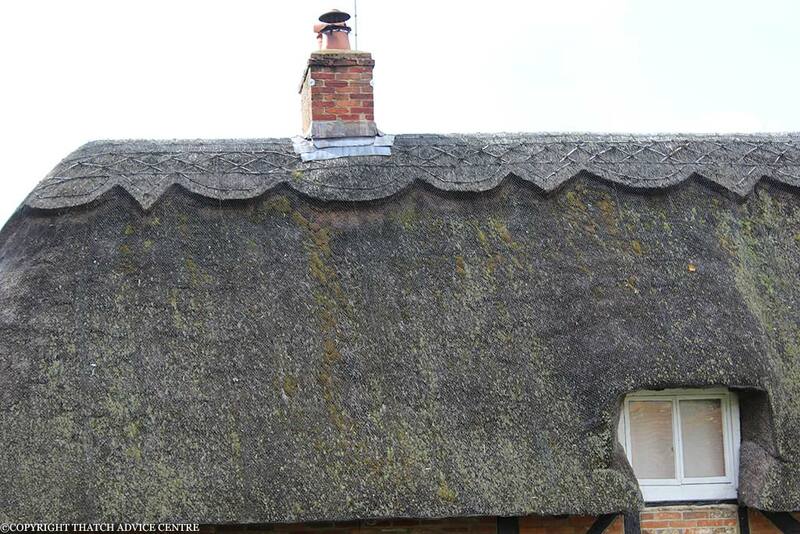 How long does a thatched roof stay new looking? About 1 – 2 years. Most then turn a charcoal grey colour. Can I spray my roof with anything to make it stay new looking? 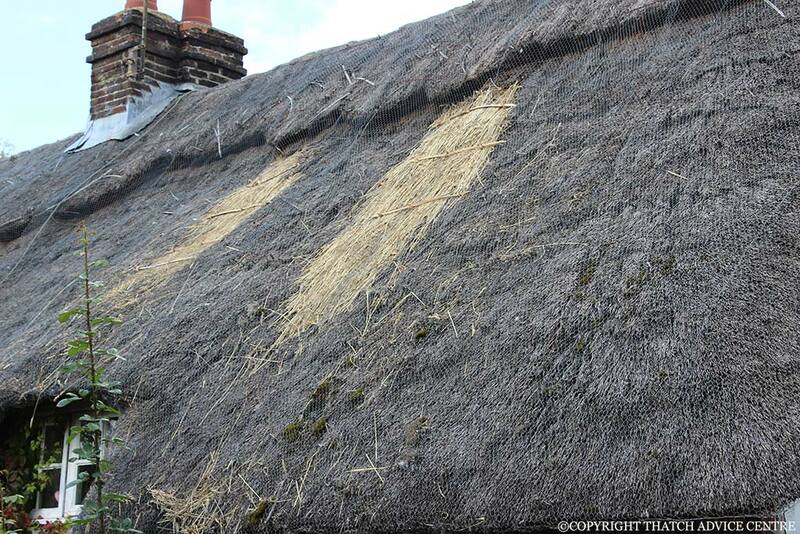 Some fire retardant sprays increase the time a new thatched roof stays looking new.